Tanasa Arano is a Dunmer commoner, employed as a charwoman at Riverview in Cheydinhal. 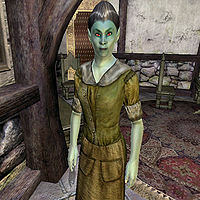 Like her colleague and fellow Dunmer, the maid Tolisi Girith, Tanasa harbors a dark secret; she is a Mythic Dawn sleeper agent and will attack you on sight on the completion of the Dagon Shrine quest. Like the other employees working under the snobbish and underpaying owner of Riverview, Voranil, Tanasa works very hard for a living. She sleeps in the basement area every night until 6am, and upon waking, enters the ground floor to start her workday, which consists of cleaning up after the many parties held in the house. She keeps working for a full eighteen hours, before finally eating a late dinner at midnight. At 2am, she returns to the basement for only four hours of sleep. Even on Loredas, which is the big party night at Riverview, Tanasa will still have to wait for her dinner until all the guests have left at midnight. Sundas, however, is her day off and at 9am, she will exit Riverview and spend the day at Newlands Lodge together with Tolisi, she will relax and converse with the regulars there. As neither of them are in any hurry to get back to their jobs, they'll stay at the bar until 11pm, where they will head back to Riverview and continue their daily routines. Her lower-class wardrobe reflects her working-class status. She wears a pair of braided leather sandals, green felt linens, and a green wool shirt. She carries around the key to Riverview, a small amount of gold, and a copy of the destruction skill book Mythic Dawn Commentaries 2, a clue to her real identity. Tanasa also knows the standard Mythic Dawn Armor and Mace spell. When you meet her for the first time she will introduce herself as such: "I'm the charwoman at Riverside [sic]. Tanasa Arano. I clean up after Voranil and his parties." On the topic of Cheydinhal, she will give you a bit of background information; "Lots of us Dark Elves came to Cyrodiil to get away from the Temple. We're sick of living under the thumb of the priests, and scraping by on the dole."